Featuring some of America’s most iconic images, Leslie Lew’s “sculpted oils” offer an emotional journey back to childhoods ranging from the 1930s to 1970s. In this interview, Lew talks to ARTDISTRICTS about her career, her unmistakable style, the projects she is working on at the moment and her recent exhibition “American Memories” at ArtSpace/Virginia Miller Galleries, the longest established gallery in South Florida*. Raisa Clavijo – You examine American pop culture by taking commercial advertising and products as subject matter. Why did you choose this specific iconography? Your father was a very famous advertising art director. Have you created pieces inspired by your father’s ads? Leslie Lew – My parents had a big influence on how I view the world. I had a great childhood and my work reflects this attitude. My dad, Les Hopkins, created a lot of the 1960s’ most popular ad campaigns: Kellogg’s, Alka-Seltzer, Marlboro cigarettes, Nabisco crackers, and so on. One of the characters in the TV show “Mad Men” is loosely based on him. I lived in that environment, surrounded by all those ads. At that time ads were roughed out using Magic Markers-dad had hundreds of them. He was very persnickety about his markers, and if they were the least bit dry, or not pointed enough, he would pass them on to me. I remember sitting near my dad’s drawing table when I was just a very little girl and copying some of his ads. I actually still have a few of those childhood drawings. One of my father’s best-known creations was the Smackin’ Brothers on a 1960s Sugar Smacks cereal box. 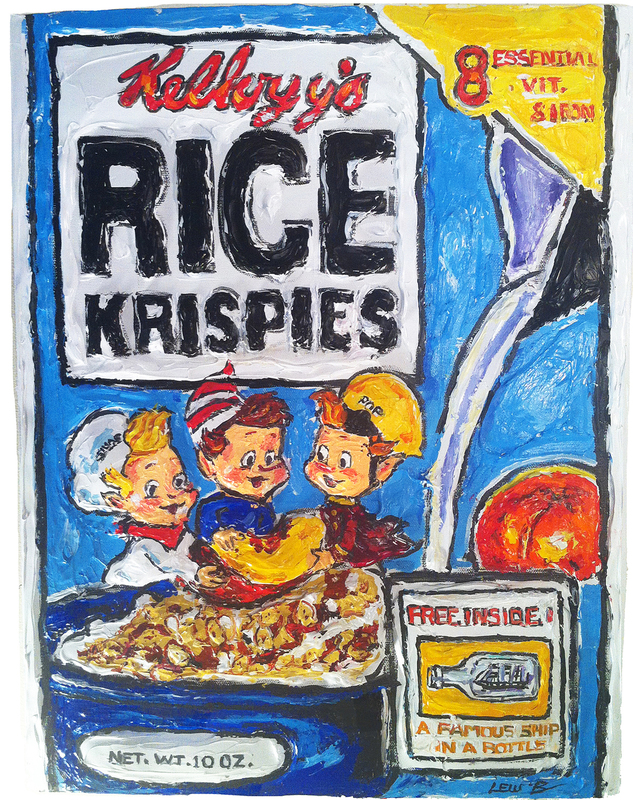 When dad passed away a few years back, I had an exhibition that I dedicated to him called “Snap, Crackle, and Pop.” As its featured painting, I did a 60 x 40-inch sculpted oil Sugar Smacks. I have kept that painting in my personal collection and it is now featured in my exhibition at ArtSpace/ Virginia Miller Galleries in Coral Gables. R.C. – Are you only focused on images from your childhood, or do you also expand to images that have become icons in American advertising? L.L. – Although a lot of my imagery relates to childhood and growing up in America, my focus is much more far-reaching and not just related to advertising. In the 1980s two of my epic paintings-a 90 x 140-inch two-floor subway scenario at Grand Central Station and a 90 x 160-inch Coney Island scene-were in a show at the Center for Visual Arts. A lot of the work that I create also comes from other people’s memories. In some ways I feel that I am a “recorder of history” and am capturing memories for all of us. One image that I feel that I have expanded and made into a new icon is the Animal Crackers box. Who in America has not had them? I ate them, as well as my parents, my grandparents, my son-pretty much every kid has. 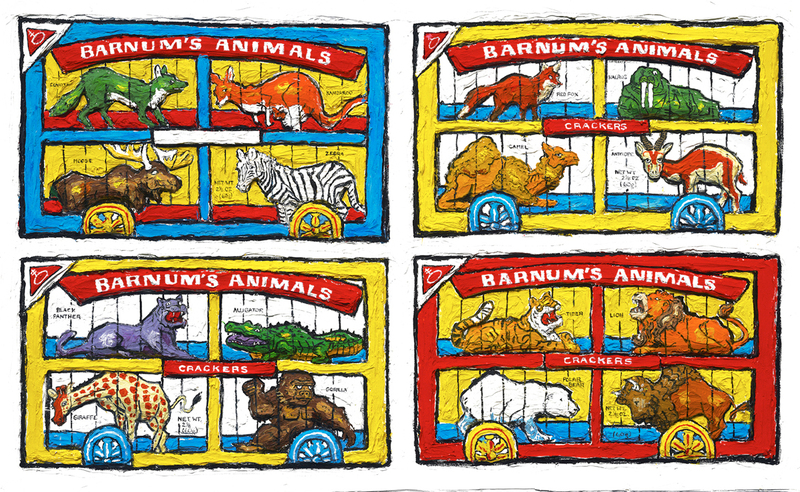 My very first Animal Crackers that I painted was acquired by the Mayo Clinic Children’s Hospital in Minnesota. The painting hangs in the lobby there. During the opening that I attended, I loved the reactions of the children and their expressions when they saw it. These kids are entering the hospital scared and sick; they have challenges. But the minute that they recognized the painting they had big smiles, each identifying with the different animals on the box, and I let them touch the painting, so they could get a tactile experience as well as a visual one. I hope that some day Animal Crackers may be even more recognizable than Andy Warhol’s Campbell’s Soup can! 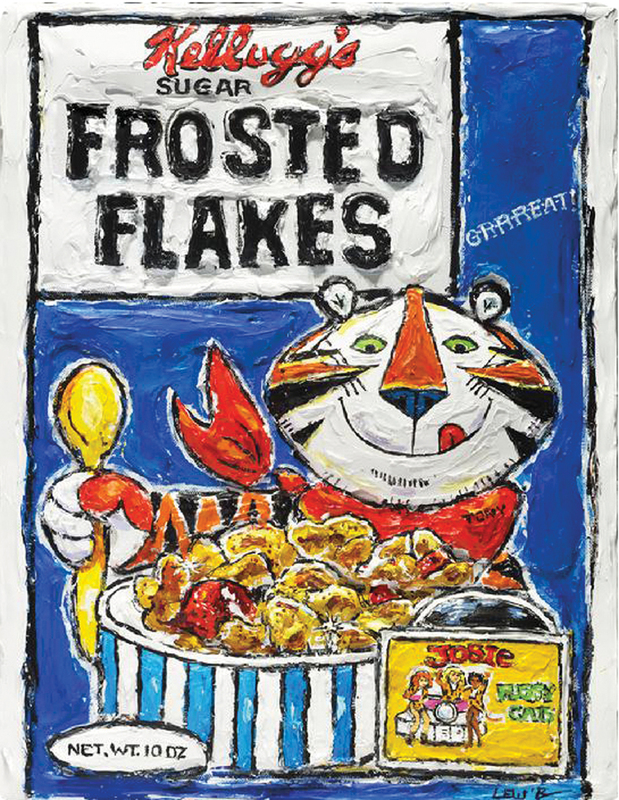 Leslie Lew, Frosted Flakes, They’re GRRREAT!, 2012, sculpted oil on canvas, 20” x 16”. R.C. – In your works, you use a technique that you call “sculpted oils.” Can you explain what this process consists of? L.L. – I invented this process and actually trademarked it. To start all of my paintings, I first sketch whatever image I am conveying in black lines with a small brush. I basically draw pretty much all of the detail as well. In the early 1980s I only used oil paint, but as every artist knows, it can take 200 years to dry. My 1986 show was installed the day before the opening. In the middle of the night, I felt this crazy shaking and rumbling-New York City had a small earthquake. Then I got an urgent call from my gallery. A circus painting that I had just done had fallen off the wall, and Gunther the lion tamer’s face had slipped down to his waist. The oils were still wet so I successfully scooped up his face, and in one of the most successful surgeries in art history, replaced it just before the opening. To prevent any more mishaps of that sort and to minimize dry cleaning bills from my collectors, ever since then I have used acrylic paint as a base for my sculpted oils. After drawing the details I take gallons of titanium acrylic white paint and mound the areas that I want to be three-dimensional. After this dries, I go back into the painting with really thick oil paint that I sculpt on top, working wet on wet, until the painting is completely finished. I work usually on one piece at a time since I really want to put all of my concentration and energy-my soul, if you will-into each painting. If you Google “sculpted oils” my name will turn up! R.C. – When did you realize that you wanted to become a visual artist? L.L. – I think that I wanted to be an artist as soon as I saw my dad draw-maybe I was 3 years old? Being around my dad and having access to all of those great colored Magic Markers certainly helped. For a little while, I also considered becoming a ballerina. When I was a girl, I was pigeon-toed. Doctors urged my mother to have it corrected with surgery, but she had another idea: I would study ballet. I enrolled in a class with a famous instructor, but she told my parents that I had no talent and would never become a dancer on any level. My mother refused to accept that answer and she installed a practice barre in our home. To give me an incentive to practice every day, she bought me a pair of very cool red ballet slippers. A year later I performed flawlessly, with perfectly positioned feet, with the New York City Children’s Ballet in their presentation of “Nutcracker Suite.” These days I have a tradition of wearing red shoes to all my openings as a reminder to myself that in the end, success comes from determination and persistence. 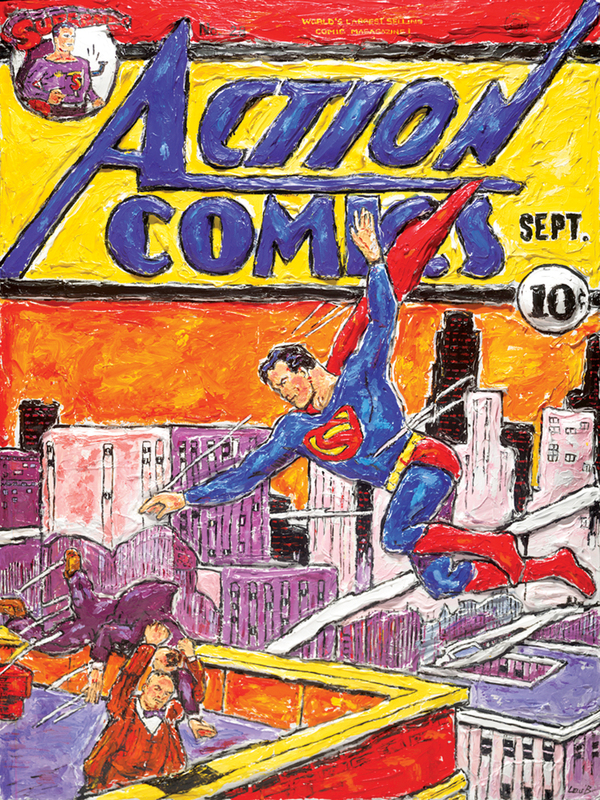 Leslie Lew, Superman Able To Leap Tall Buildings with a Single Bound, 2012, sculpted oil on canvas, 48” x 36”. All images are courtesy of ArtSpace/Virginia Miller Galleries, Coral Gables (Miami), Florida. R.C. – What artists have influenced your work? L.L. – I love Van Gogh because of his use of color and thick paint. Then there’s Andy Warhol, Lichtenstein and Rembrandt. I saw a Rembrandt painting at the Met in New York back when I was a Brownie scout, and I bought that art postcard with my allowance. Although I’m a contemporary artist, I admire at least two artists that you might find puzzling. One is Fra Filippo Lippi, the master who taught Botticelli, and whose work I learned to love while studying in Florence. His work is phenomenal, his draftsmanship and use of color is right down my alley, totally perfect. He taught me not to be afraid of color, to paint. The other artist is Norman Rockwell. My dad loved Rockwell. There has been so much debate about whether he was a “true artist” or an illustrator, especially during my art school days. I think that what Rockwell did was very important, because he captured the memories of his time. I feel that I am doing something similar. Maybe I’m the “Norman Rockwell” for our time. I’m grabbing our memories and recording them for history. R.C. – You studied at the School of the Art Institute of Chicago. When did you realize that you had found your style, your own language? Is there a work from those years that you remember as a piece that indicated the language that you would follow in your career? L.L. – A lot of artists search for years to find their own special technique, their language. For me, it started by literally falling into my lap. I was studying painting as an undergraduate with Ray Yoshida, a wonderful artist and one of the leaders of Chicago’s Hairy Who art movement. He was giving me a hard time. You see, at the time I was painting thick, plein-air landscapes and he kept pushing me to find my own voice. Wow! A light bulb went off in my head, and I did a series of scenes in supermarkets, drugstores, barber shops, statuary stores and diners. I submitted that series and was accepted into the MFA program of the School of the Art Institute of Chicago. That also is how I invented my “sculpted oil” technique. I always painted thick, but to further emphasize the products I started to sculpt the products with paint, to make them stand out three-dimensionally. R.C. – You were part of two important artistic movements, the Hairy Who movement in Chicago and the East Village movement in NYC, in the 1980s. How did contact with the creative environment of these movements influence your work? L.L. – Actually, I have been part of three artistic movements. The third one was started by Michael Bidlo and me in the late 1980s and was called East Village “appropriationist” movement,” referred to in the January-February 1988 issue of Art/World. Although the Hairy Who art movement had a bit of a dark side to it, it still had a very playful approach, even though it was considered fine art. This gave me permission to also be playful with my art. My first art piece ever to be exhibited was an aquatint called the School Store. It was selected to be exhibited at the Museum of the Art Institute of Chicago alongside Ray Yoshida, Karl Wirsum and other artists from the Hairy Who movement. R.C. – Your works are more than simple reproductions of products and advertisements; they are anthropological approaches to American society by showing its tastes, interests, concerns, dreams and aspirations. Do you do any research prior to conceiving a piece-I mean any investigation about how the iconography of a product’s advertising has impacted social behaviors and vice versa? L.L. – Art through the ages has depicted anthropological examples of everyday life and activities of people during that era. I photograph, I go to book stores, I do Internet research, and I stay aware and open to everything; and most importantly, I listen. R.C. 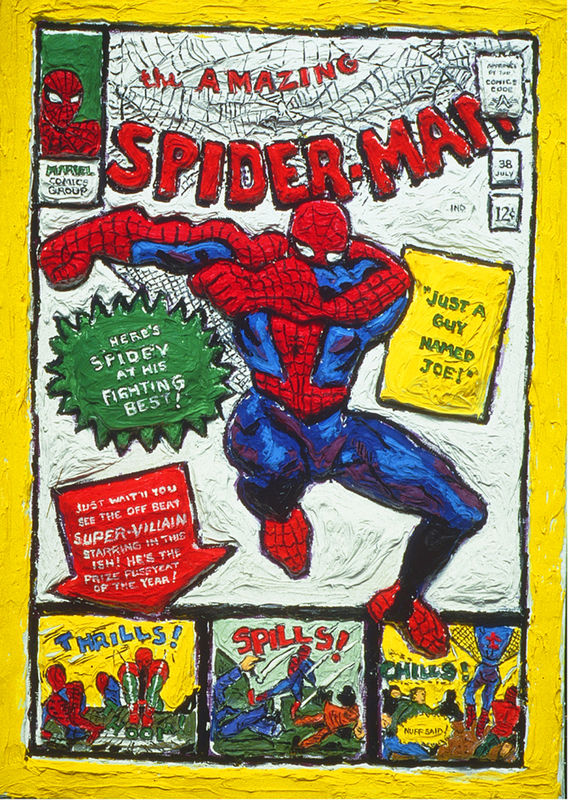 – You met and exhibited with such renowned American artists as Andy Warhol, Keith Haring and Jean-Michel Basquiat. Can you share any stories about them? L.L. – While I was still in graduate school I was invited to participate in a program affiliated with the Whitney Museum called “Semester Studio in New York City.” While there, I was one of the less-well-known artists, along with established ones like Andy, Keith and Jean-Michel, invited to participate in an East Village exhibition called “The Match Box Show,” paintings on matchboxes and matchbook covers. I displayed 10 matchboxes that I painted in a variety of images, from comics to a traditional Raphael Madonna and Child, in my sculpted oil technique. I was formally introduced to Andy by Jean-Michel at my 1985 opening. As much of an icon that he was, he was always nice to the new kids on the block. Andy was actually very shy and always carried his Polaroid camera as a way to engage people in conversation. Later I did a painting of the opening scene and I put Andy in the corner, holding his Polaroid camera. One of Warhol’s exhibitions at that time included a children’s book based on Japanese toys. 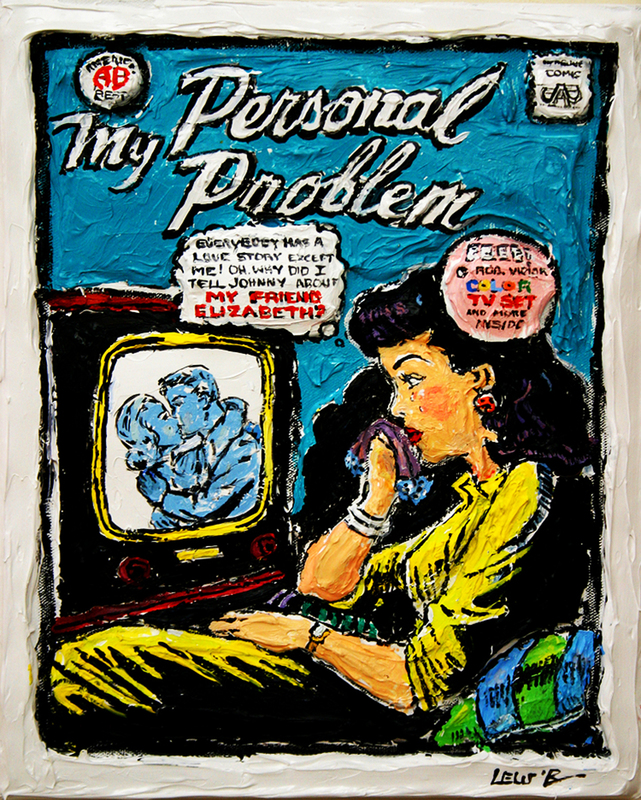 I thought it would be fun to appropriate Andy’s serigraph images of the toys and create them as sculpted oil paintings. One of them was a robot called Moon Explorer. 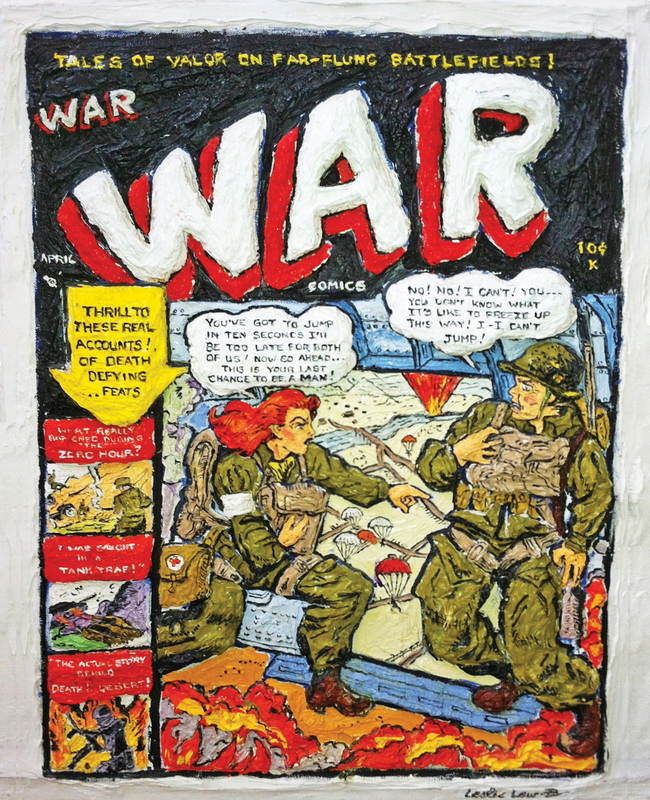 Leslie Lew, War, 2005, sculpted oil on canvas, 24” x 18” x 1.5”. Andy got a big kick out of my paintings and offered to trade a Marilyn serigraph for my Moon Explorer. I really didn’t want to part with any of my paintings at the time, but I agreed to do a trade with him later. Then Andy went in the hospital for a routine gallbladder surgery and unfortunately passed away. The Moon Explorer painting remained in my son Sean’s room until it was recently collected, appropriately enough, by Woody Spring, an astronaut who landed on the moon. After Andy died, I was invited along with Beth Phillips, who photographed my work and Andy’s, to help archive and document all of his work stored at the Factory. It was fascinating to pull out so many multiples of Andy’s pieces that he had tucked away in every closet space. R.C. – “American Memories” is your first exhibition at ArtSpace/Virginia Miller Galleries. What are your impressions? How was your work received by the public? L.L. – Great! What a wonderful experience!!! First off, ArtSpace/Virginia Miller Galleries has an incredible exhibition space! The show is actually a mini-retrospective of nearly 60 of my works covering the 1980s to the present. I met Virginia and her husband Bill at Art Basel Miami Beach last year when they saw my work at the Scope/Overture Pavilion, where I was exhibiting alongside the Andy Warhol Collection. Virginia immediately loved my work and I took to her and her enthusiasm, and I loved the fact that she had been the art dealer of the late and great artist Alice Neel, whom I always admired. During my openings at ArtSpace/Virginia Miller Galleries I met so many people from so many walks of life. I found it very interesting that different paintings spoke to different people and their memories. One of my very earliest collectors, Martin Margulies, came to the May opening. It was so nice to see him and to see his reaction to the show. He told me that I should be very proud of myself and that the show was beautifully installed, extremely strong and relevant. Marty collected one of my very first large-scale paintings called Trick or Treat, a 60 x 72-inch work that was based on some of the early childhood primers. Marty has more than 4,500 significant art works in his private collection and at his “Warehouse” museum. A few years ago an art book titled The Martin Z. Margulies Collection was released and included around 100 of his favorite pieces. It was an honor to have my work included, next to Lichtenstein, Warhol, Stella, Miro, Picasso, de Kooning and all those famous artists. L.L. – This project is near and dear to me, and is still a work in progress. I wrote Buki’s Garden a few years ago. The story is about a kitty that looks like a gremlin and none of the other animals will play with her because she looks different. It is not until she frightens away the mean old rat that has been terrorizing the garden that things improve for all the animals. Buki ends up saving the day, not by being mean but just by being herself. The story is illustrated with my sculpted oil paintings and drawings and is actually based on my real kitty, Buki, who has a scrunched-up face and actually does look like a gremlin. The story teaches kids to be more tolerant and accepting of differences. With the epidemic of kids bullying and being bullied, it carries a timely message. In 2004, I got a New York Arts Council grant to read the story and conduct a workshop for a few libraries and the Katonah Museum. I created prints of Buki outlined in black on canvas mounted to canvas board, and then added white sculpted paint to each one to make them three-dimensional. After I read the story, the kids are all invited to paint their own versions of Buki, any way they want. I recently traveled to Detroit with 130 of the sculpted-acrylic Buki canvases and conducted a series of readings and workshops for the underprivileged kids in the area. I visited the Children’s Hospital of Michigan, shelters, learning centers and churches, reading the story and having local children finish the paintings. It was so well received that the popular Michigan broadcaster Aliza Zee featured a Sunday interview of it on CBS radio. Statewide, local TV and Detroit newspapers all followed and photographed the events. They are now documented on YouTube. The best thing about the entire event was that the kids loved the story and Buki. They even asked me if they could friend Buki on Facebook! The story really carries an important message and is beautifully illustrated. I am now actively seeking a children’s book publisher that can publish the book so it can be more widely distributed to reach more children. R.C. – What pieces are you working on at the moment? L.L. – Really interesting commissions! I have always been good at capturing likenesses, and I’ve done a lot of them in my sculpted oils. I like to include some background-to create environmental portraits. I recently finished a beautiful portrait of Virginia Miller called Portrait of Virginia Miller and Alice Neel, in which I painted Virginia in the foreground and Neel’s 1978 portrait of her in the background. It was so much fun to see the reaction of people at the opening-they were amazed at her likeness! Right now, I am doing a commission of one of the first McDonald’s that opened in Illinois. The collector traveled to Miami for my opening and had this great photograph of his favorite McDonald’s from the 1960s with some old cars. He is sending me a picture of when he was a boy and I will include that in the scene. R.C. – What is your goal as an artist? Have you already met it? L.L. – My goal as an artist is to continue to grow, learn, explore, and create. I don’t think you can ever be finished, because something new is always around the corner. As long as I am breathing, I will never stop painting! Raisa Clavijo is the editor of ARTPULSE and ARTDISTRICTS magazines. * Special thanks to Virginia Miller and Bill DuPriest for coordinating this interview.